You are currently browsing articles tagged switzerland. Never really thought that Swiss wine would remind me of my dad and his brother, both men in their 50s who behave like teenagers when they get together. This is a fraternal duo who still prank call co-workers with Kennedy accents on special holidays. This is a fraternal duo who still laugh about spinning their youngest brother on the whirly-stools at McDonalds to make him dizzy and nauseous so he wouldn’t be hungry and they could eat his fries and happy meals. Predictably, the youngest brother is now a thin engineer who develops electric engines to replace internal combustion engines that rely on repetitive spinning motion. Coincidence or utterly predictable consequence? Only the engineer can say. Swiss wine though has little to do with vintage McDonald’s, GM’s hugely successful Volt engine or brotherly sing-alongs. Swiss wine has to do with weird, unexportable grapes that are available in Switzerland only thanks to voracious Swiss milkmaids and inexplicable yodelers. At least, that’s the reason this wino believes the Swiss refuse to export their wines. Notice that it’s not the high price of the Swiss currency, the world’s most expensive prices or the fact that they’re landlocked and the size of West Virginia – it’s the fault of the milkmaids and yodelers. Swiss wine (when available) has a few surprises with it. Random indigenous grapes that nobody else grows such as Humagne Rouge (today’s featured bottle), the surprisingly unrelated grape of Humagne Blanc, a Petit Arvine, Cornalin (the parent to today’s wine) and probably lots of others that are even rarer and can’t be found even in everyday supermarkets on one’s lunch break. Humagne Rouge is practically unknown anywhere outside of Switzerland and even in Switzerland, it’s really only in that region around Geneva in West Switzerland known as “Valais” that it’s somewhat known. This is a region that’s one wrong turn from the route of the Tour de France and straddles that lower part of the country near Geneva (American for “Geneve”). Most of Switzerland’s wine comes from this area, likely due to its lower altitude and proximity to France where all wine is consumed immediately and in enormous quantities. Voulvez-vous boire avec moi, Moulin Rouge? Humagne Rouge, as the “Rouge” name implies, is all about the color red and Nicole Kidman trying to play a French whore (ah-hem: “courtesan”) in red makeup. Spoiler alert: Ewan McGregor and Humagne Rouge are still together at the close of the movie. 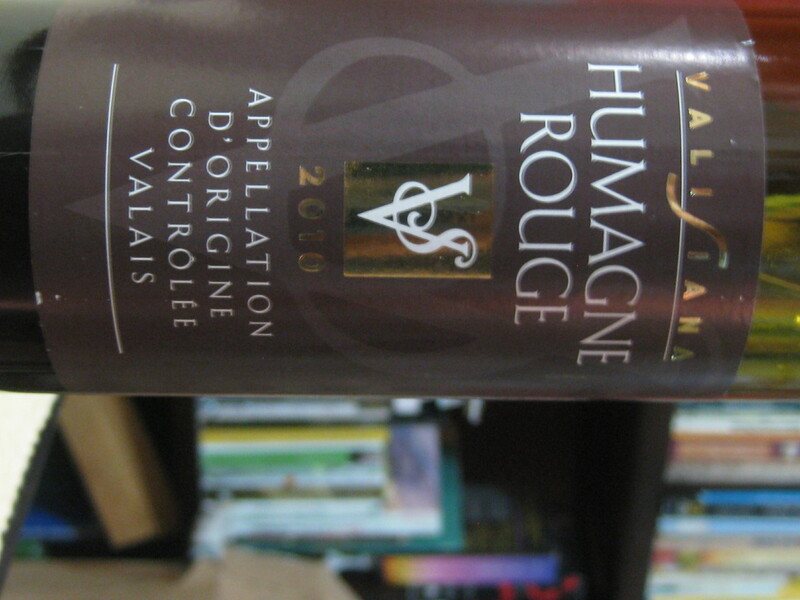 And yes, true to its name, Humagne Rouge is a grape that makes a pretty dark, really red wine that goes well with venison and soul-crushing lost love in French bordellos. Why then does this obscure Swiss grape with overtones of lost love and excessive makeup remind me of my dad and his brother? If not obvious already from that description already, it has to do with the taste. Quaff back a glass of Humagne Rouge and you’re hit with cherries – not just normal cherries, but sweet cherries, then black cherries and then sour cherries at the end. And if you’re in Switzerland, you’re probably pretty close to ridiculously good chocolate. So you’re drinking your glass of Humagne Rouge with a bar of dark chocolate in one hand. And if you’ve ever been to Dad and Tio Steve birthday, Christmas or Kennedy-themed parties, you know that there’s only one acceptable gift: chocolate-covered cherries. In a box, probably with one or two missing. This wine with that chocolate is pretty much that memory gift-wrapped, then unwrapped, then missing a cherry or two, then gifted. 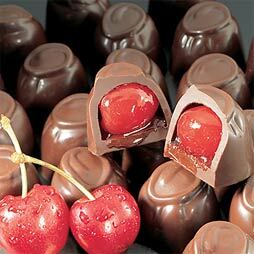 Near full box of chocolate covered cherries. We’re talking Dad and Tio Steve sharing their Christmas gifts without anyone eating a couple cherries out of the box – an unheard-of feat! OK, maybe only a couple missing but certainly more than half a box remain. Tasting-wise, it’s a cherry smell, then with loads of black cherry. 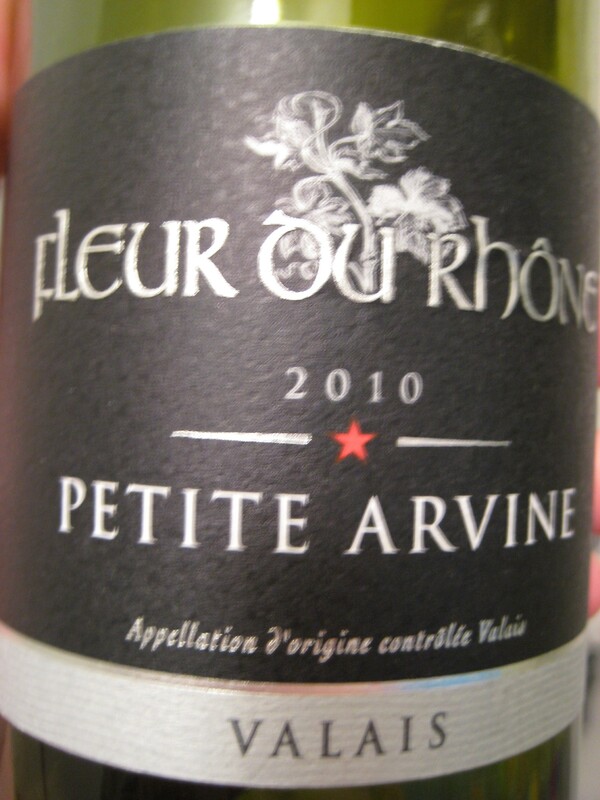 Slightly sweet taste with moderate tannins that grow deeper throughout but still a light body. More wild blackberry later on that has some krækiber (pronounced “craigberry”) and other wildberry pungency – medium finish, not lasting crazy long or falling off a cliff like a coyote either. 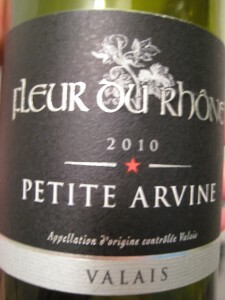 Kinda different in a good way with bit of sour cherry at the end. Drink quickly before your brother steals it. 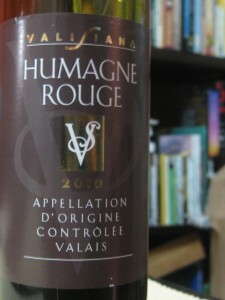 Humagne Rouge 2010 Valisiana from Valais, Switzerland (13.5% alc.) – sorry guys, no link. Find it at the really-fun-to-visit Coops. Perhaps Zurich’s best value lunch or dinner or wine store. * Valais is Switzerland’s largest wine canton. * 1 person has liked Humagne Rouge on facebook. Ed. note: it wasn’t me but you can be the second.